Test your knowledge of the proper scale for model horse show setups and dioramas on the following pages. Scale refers to the ratio of measurements of model to real when making a miniature. 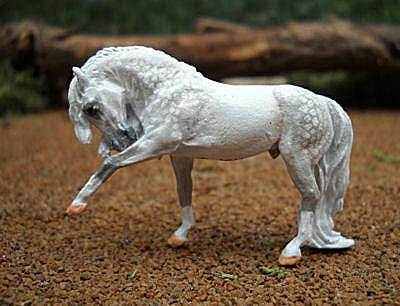 A scale of 1:9, as in Breyer Traditional scale model horses like this discontinued mahogany bay original finish Proud Arabian Stallion, is the largest among the model horse scales. At 1:9 scale, one measurement (of any type) on the model, corresponds to 9 measurements on the full size animal. One inch on the model would equal 9 inches on the animal. It doesn't matter what you use as props in your photo show set ups; as long as the items are in the correct proportion to the horse, it sets the scale. Are the background bushes and plants in this photo in the right scale or proportion to the model? Yes. Even though the "tree" behind the horse is a clump of grass, it gives the appearance of a tree in the proper proportion to the model. This Breyer horse was photographed indoors using a poster for the background image. The poster presents an attractive backdrop for this customized (haired and painted) Breyer created by a young collector. Is the background in scale with the model? The model and background work well together. The trees and shrubs, as well as the bridge in the photograph, appear to be in the background, with no distracting shadows. The young artist who created this customized Breyer horse may wish to use a simpler background to show off her model. As you explore performance showing for your Breyers and other model horses, the concept of scale becomes increasingly important. The more props you add to a photo show setup, the greater the chance of making a mistake in the scale of the props. Is the fence in scale with this model for an English hunter performance photo? Unfortunately, no. The Breyer play fence is too high for a hunter class and not the correct type. The "flower pots" on either side are too large, with the leaves of the ivy looking like an alien plant. The Breyer Justin Morgan in the background looks like he is refusing to jump the too high fence - this is not a good quality photo for shows! You can create props for your model horse show photos from anything around the yard or your house. This photograph was taken outside. While the grass should have been clipped shorter (it's too tall for the Traditional Breyer scale horse shown here), the natural low fence the horse is cantering towards is in scale to the horse. This could be a fox hunting scene or a hunter pace-type setup. The jump was made with rocks piled on the sides for the jump standard, and large branches cut to size and placed in the middle for a faux-log jump. When all the props and accessories for model horses are in the right Breyer scale, the entire photo just looks so realistic you'd swear it was an actual horse. This Arabian scene exemplifies the best use of all types of model horse show props: a lovely model, a doll in the right scale wearing the appropriate costume, model horse tack that fits, and a background and props on the ground that are all in Traditional scale and sized proportionately to the horse. The entire picture works together to make the viewer feel she's stepped right into the scene. As you create your own model horse show dioramas, backdrops and props, consider the images in this fun quiz and why some are in scale or proportion and others aren't. If you're not sure how big something should be, look for photos of real horses competing in the performance event you have in mind. You'll quickly realize, for example, that in a hunter class, the typical fence sizes range from 2' 3" to 3' 6" - and you'll see pictures of average sizes horses standing next to fences, jumping them, or galloping near them. Notice how tall they are and where the top of the fence comes up to on the horse. Soon you will develop a good eye for scale of props for model horses, learning to recognize items that work well and those that don't work well. Try new things and keep learning. Share your photos with other collectors and get feedback. Most important of all, however, is to have FUN!